Pop quiz: Sarah Palin, in a speech during the 2008 presidential campaign, famously accused candidate Barack Obama of "palling around with terrorists." Who were these terrorists she was referring to? Bonus question: How did at least one of these said terrorists handle all of the attention, much of it threatening, that blossomed during the campaign? Answer: Bill Ayers is one of them, of course, who has spent many a summer hiding in broad sunshine in our North Coast mountains, eating good food with family and friends, and writing. 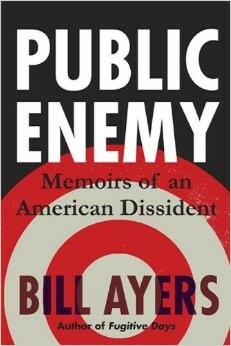 Bonus answer: If you read Ayers' new book, Public Enemy: Confessions of an American Dissident, you'll get a thorough account of his feelings and thoughts on that whole affair and other moments in his life post-fugitive. Public Enemy is the sequel to Ayers' Fugitive Days: Memoirs of an Anti-War Activist, a chronicle of his and his wife, Bernardine Dohrn's, 10 years on the run following their involvement in the radical-left Weather Underground in the late 1960s and the 1970s. "These were different times with new responsibilities and unique demands, to be sure. But I had a good job and work to do that I thought was important, and I was deeply connected with a sturdy network of brilliant students and a huge community of agitators, activists, dissidents, and outcasts — lepers in a metaphorical sense, or at least folks who’d been forced out of the camp for 'having issues' — as well as organizers and engaged colleagues. I had a cast of heroes, sheroes, weirdoes, and queeroes in my life, I knew who my friends were, and I knew I wasn’t alone. So under the bus or tied to the railroad tracks, I was feeling OK — pretty great in fact. The best in the world, as my dad would have said." Public Enemy goes on sale starting tomorrow, Oct. 8. Northtown Books in Arcata says it will have copies. A news release from Ayers says, "Several Tea Party brothers have written to tell Bill they will take the book to the Annual Rush Limbaugh Book Burning Party — so extra copies are in order!" Ahem. The North Coast Journal interviewed Ayers and Dohrn in Arcata in 2009. You can read that here.